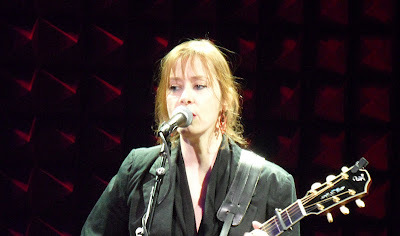 I first saw Suzanne Vega in the early 80's, a little before she got her recording contract. If I remember correctly at that point all she had was the song "Small Blue Thing." I recall her being touted as the big new songwriter coming out of the downtown folk scene. 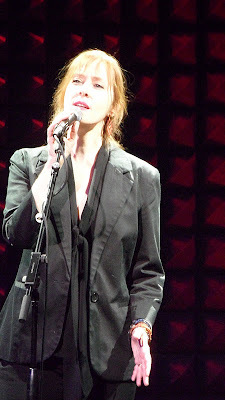 At that point, I can't say I was totally enamored with her talent but like many people I was intrigued. Nowadays, I can honestly say that through the years she has grown on me. On Wednesday night, I really enjoyed Vega's set. She seemed a little more lively as a performer and a lot more animated than I recall. 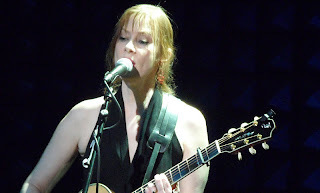 I don't know if it was my remembrance of her from years ago or my projection; I was expecting a demure woman with guitar in hand solemnly standing behind her mic. However, I actually found her entertaining but still somewhat coy. At 7:35 an announcement came from the sound booth, which isn't the norm at Joe's Pub, "Good evening New York City, would you please welcome to the stage Suzanne Vega." Vega and her guitarist Gerry Leonard, who by the way looks like the actor Alan Rickman, opened up the set with "Marlene On The Wall." 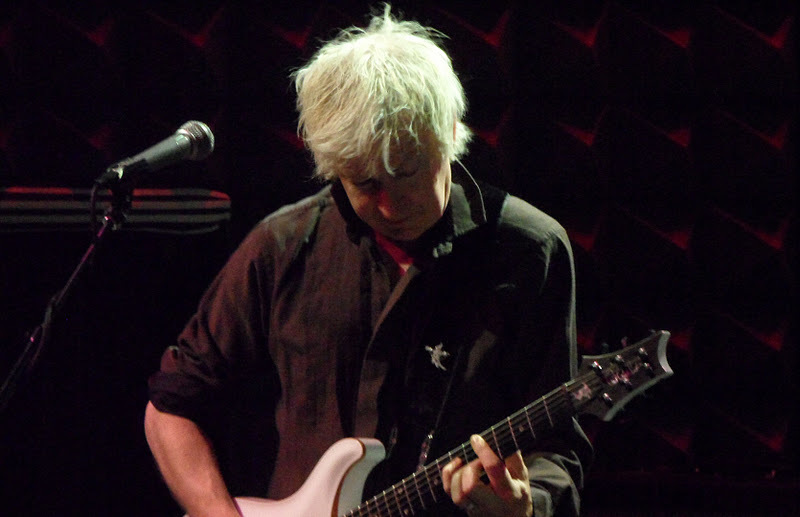 Leonard played a simple but effective lead on his electric during the musical break and both played the song staying true to the original arrangement. Vega went directly into "When Heroes Go Down" which I was hearing for the first time. I listened to the song after seeing the show and decided I liked the live arrangement better. The recorded band arrangement to my ears sounded dated. 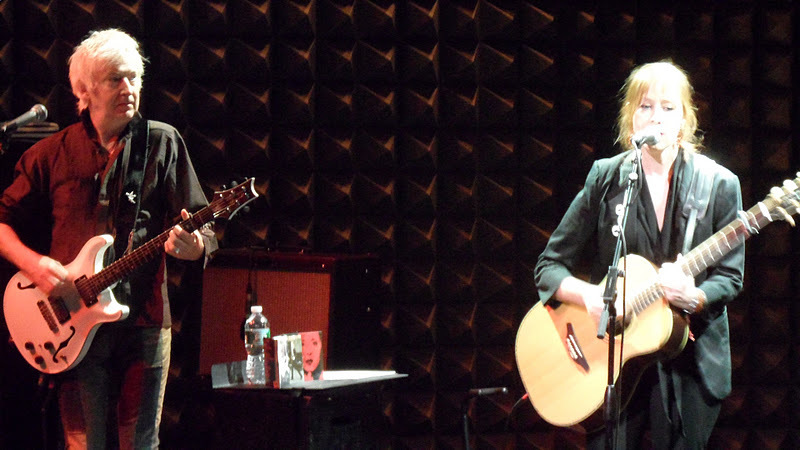 After the song, Vega said she was kind of busy since the last time she played Joe's Pub. She stated that she started her own record label then sort of back tracked by stating that doing so "has been interesting... starting a corporation in this (economic) climate -it's been... what can you say - interesting!" Vega told the audience that she's recording her entire catalog and new material while putting it out in volumes. 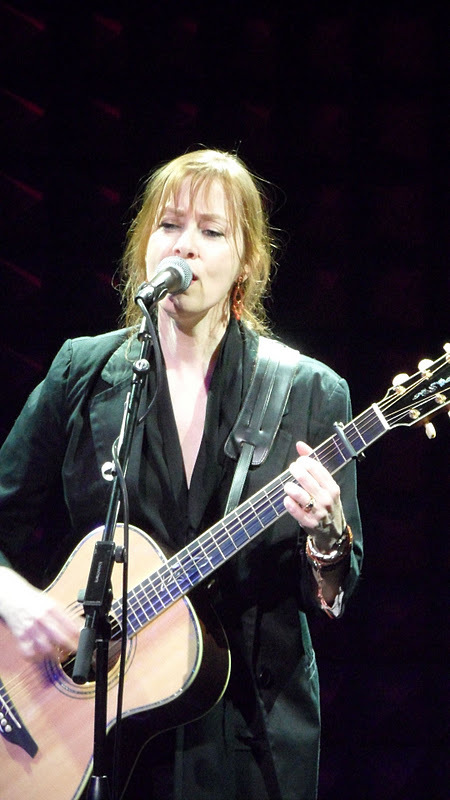 Vega told the audience that Volume One of her new recordings was a collection of love songs. She then made the audience laugh by saying "I found to my surprise that there are many journalist who want to argue with me about my concept of love or even songs - sometimes." She then said she was going to perform some of those love songs her critics didn't consider love songs beginning with "Small Blue Thing" and directly following with "Caramel." Wednesday night was my first time hearing "Carmel" which I loved. It had the sort of dramatic quality that Tom Wait's is known for. 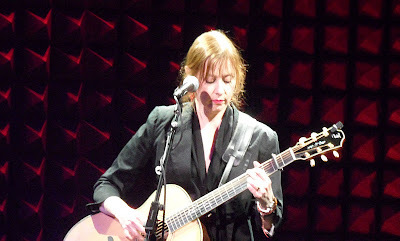 It was also nice that Vega put her guitar down and let Leonard do the playing. The following song "Frank and Eva" was cool and had a bit of a rock feel but I wasn't feeling it. I also think that Leonard's background vocals weren't helping. Before singing "Gypsy," Vega told a story about a boy from Liverpool that she met when she was 18, and how he and she shared a love of Leonard Cohen's music in common. The story was a sweet and funny intro to the song that followed. The next three songs were the part of the show I enjoyed most. 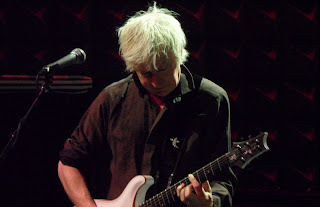 The songs were written with Duncan Shiek for a musical play called Carson McCullers Talks About Love. Among other works McCullers wrote the novels "The Heart Is a Lonely Hunter,""Reflections in a Golden Eye" and "The Member of the Wedding." 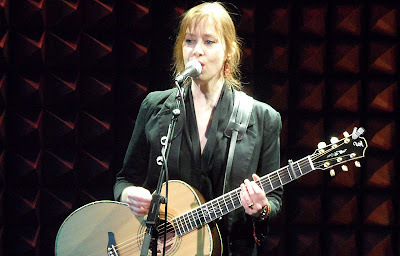 Vega explained that the first song was McCullers thinking about coming to New York City and how famous she was going to be and how people were just waiting for her to arrive. The song was "New York Is My Destination;" it had a breezy 6/8 feel. After she sang the song, Vega stated that it was very odd to sing a Carson McCullers song in heels because McCullers wore nothing but Oxfords and would never wear anything with any sort of heel. Vega explained to the audience the Carson McCullers' personal life was both "complicated or evolved." (I was tempted to scream - "which is it?") Vega said that McCullers was married to a man but that they both had affairs with both men and woman. The next two songs were about women but I'm not sure if the latter of the two was an actual lover or an assumed lover. The songs were "Ann Marie" and "Harper Lee." Like McCullers, Lee was a writer and she wrote "To Kill A Mockingbird. 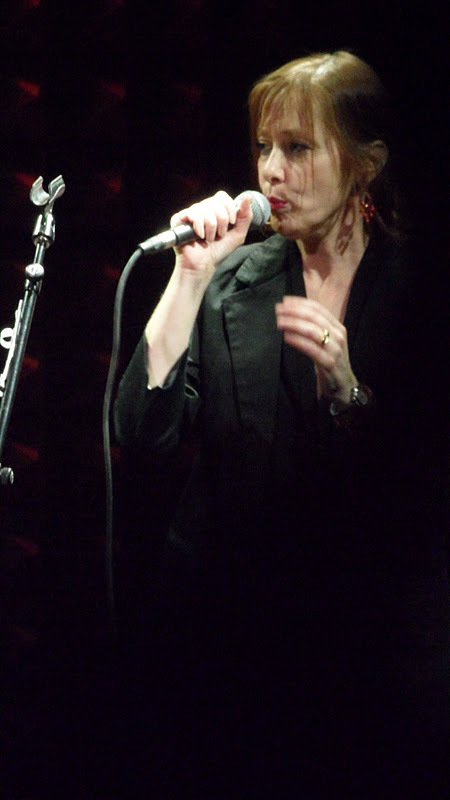 Vega sang "Harper Lee" with mic in hand and was somewhat animated for the partially spoken lyric. Vega told a very funny story about her mother's cat who died and was given an exceptional funeral. I'm not going to retell the story because I'm sure she will tell it again. (I don't want to be a spoiler) After the cat story, Vega did a rockin' version of her song "Tombstone," on which Leonard played guitar with a distortion pedal. Vega and Leonard went directly into the next song which was the very cool "Blood Makes Noise." I wondered if HBO thought about using the song for either the "True Blood" or even "Boardwalk Empire" series. The most interesting song of the evening at least melodically was "The Man Who Played God." It was written by Danger Mouse and Sparklehorse for an album featuring a variety of guest artists titled A Dark Night of the Soul. Vega dedicated her performance to Sparklehorse who, I learned while writing this posting, committed suicide in 2010. Immediately after ending the last song, someone in the audience yelled out "The Queen and The Soldier" and Vega said "well alright!," the audience laughed and Vega immediately complied. The song is a sad parable in 3/4 time. I believe the meaning behind the story is to show how those in power cling to what they have and know, even if it causes them heartache. The song that followed was "Some Journey," which like many of the songs, was from Vega's first album. I was a little surprised because I thought by now she would be pushing some newer material. Vega ended with "Luka" and then appropriately with "Tom's Diner." In light of the current Penn State child sexual abuse scandal, "Luka" touched me a lot more than it ever did before. Two different kinds of abuse - same victim - children. The lines "They only hit until you cry, After that you don't ask why.You just don't argue anymore" really got to me and made me feel sad.